An illustration of the defense of Montevideo from Isidoro De-Maria's book, Anales de la defensa de Montevideo. The Uruguayan Civil War, also known in Spanish as the Guerra Grande ("Great War"), was a series of armed conflicts between the leaders of Uruguayan independence. While officially the war lasted from 1839 until 1851, it was a part of armed conflicts that started in 1832 and continued until the final military defeat of Blancos in 1904. Out of supporters of presidents Rivera and Oribe grew Colorado Party and the National Party, both of which received backing and support from foreign sources, including neighboring Empire of Brazil, the Argentine Confederation, Buenos Aires Province as well as European powers, primarily the British Empire and the Kingdom of France, but also a legion of Italian volunteers including Giuseppe Garibaldi. As the population of Uruguay at that time was about 60,000 out of which 15,000 lived in Montevideo, the various "armies" rarely rose to more than a couple of thousand soldiers and horsemen. The first Uruguayan president Fructuoso Rivera. After the proclamation of Uruguayan Independence in 1828 a conflict for primacy arose between the leader of the Thirty-Three Orientals Juan Lavalleja and veteran military commander Fructuoso Rivera, who on November 6, 1830 was chosen as the first President of Uruguay. In June 1832 Lavalleja's supporters attempted to kill Rivera and on July 3 the Montevideo garrison revolted, calling for Lavalleja to be made Commander-in-Chief. Rivera, with the help of Argentine Unitarians defeated Lavalleja on September 18, 1832 at Tupambaé, forcing Lavalleja to flee to the Brazilian province of Rio Grande do Sul. There Lavalleja organized a new force with the support of Buenos Aires strongman Juan Manuel de Rosas and in March 1834 invaded Uruguay, only to be defeated by Rivera once again. On March 1, 1835 Manuel Oribe, another of the Thirty-Three Orientals, was elected as the second President of Uruguay while Rivera remained as the commander of Army. Oribe pursued his own policies and in January 1836 removed Rivera from the command and gave amnesty to his old comrade Lavalleja. On July 16, 1836 Rivera rebelled against Oribe. To distinguish his soldiers, Oribe ordered them to wear a white armband. Rivera then ordered his supporters to wear blue, but as it quickly faded, they started using red armbands. Out of these military distinction marks quickly emerged the conservative Blancos ("Whites") and the liberal Colorados ("Reds"). The Colorados were led by Fructuoso Rivera and represented the business interests of Montevideo; the Blancos were headed by Manuel Oribe, who looked after the agricultural interests of the countryside and promoted protectionism. In order to support Oribe, Lavalleja organized an army in Argentina and moved against Rivera, who was helped by Argentine Unitarians led by General Juan Lavalle. On September 19, 1836 Rivera was defeated at the Battle of Carpintería and fled to Brazil, where his troops joined the newly proclaimed Riograndense Republic. With the help of this republic Rivera invaded Uruguay in 1837 and on October 22 defeated Oribe's forces at the Battle of Yucutujá and completely crushed Oribe on June 15, 1838 Battle of Palmar. In 1838 France had started a naval blockade of Buenos Aires port in support of their allies the Peru–Bolivian Confederation who were involved in the War of the Confederation with the Argentine Confederation and Chile. Unable to deploy land troops, France looked for allied forces to fight Buenos Aires strongman Juan Manuel de Rosas on their behalf. For this purpose they supported Fructuoso Rivera and helped him to defeat Oribe, who was on good terms with Rosas. On October 24, 1838 Oribe resigned and fled to Buenos Aires, and Rivera assumed power. Rosas did not recognize Rivera as a legitimate President, and sought to restore Oribe to power. Rivera and Juan Lavalle prepared troops to attack Buenos Aires. At this point, both the British and French troops intervened, transforming the conflict into an international war. On December 6, 1842, the Blancos under Manuel Oribe and the Colorados under Fructuoso Rivera fought the Battle of Arroyo Grande. Rivera's forces were utterly defeated, and Oribe proceeded to lay siege to Montevideo. With the destruction of the Uruguayan army at the battle of Arroyo Grande, it was assumed that the country's capital, Montevideo, would fall to the combined forces of the Buenos Aires governor Juan Manuel de Rosas and the former Uruguayan president Manuel Oribe. However, Oribe's siege of Montevideo lasted for nine years. The newly freed slaves, who formed a contingent 5,000 strong, and the community of foreign exiles were mostly responsible for the defense of the city. The British Empire eventually saved the city by allowing it to receive supplies. First, the British and French naval forces temporarily blockaded the port of Buenos Aires during December 1845. Then, the French and British fleets protected Montevideo from the sea. French, Spanish and Italian legionnaires, led by Giuseppe Garibaldi, teamed up with the Colorados in defending the city. Also in 1846, the 73rd (Perthshire) Regiment of Foot, sent by Britain, arrived in Montevideo and defended it for seven months against besieging Argentine troops. Historians believe that the French and British forces intervened in the region to ensure free navigation along the Rio Parana and Rio Uruguay. However, in 1850, both the French and British withdrew after signing a treaty which represented a triumph for Juan Manuel de Rosas and his Federal Party in Argentina. After the withdrawal of British and French troops, it appeared that Montevideo would fall to Juan Manuel de Rosas and Oribe. However, an uprising against de Rosas led by fellow Federalist Justo José de Urquiza, governor of Argentina's Entre Ríos Province, with the assistance of a small Uruguayan force, changed the situation completely. Manuel Oribe was defeated in 1851, leaving the Colorados in full control of the country. Brazil followed up by intervening in Uruguay in May 1851, supporting the Colorados with financial and naval forces. This led to the Platine War with Rosas in August 1851. In February 1852, after being defeated at Caseros, Rosas resigned and Urquiza's pro-Colorado forces lifted the siege of Montevideo. 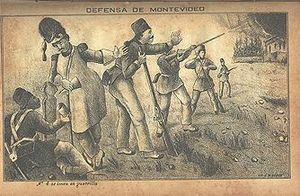 The government of Montevideo rewarded Brazil's financial and military support at the final stages of the war by signing five treaties in 1851 that provided for perpetual alliance between the two countries. Montevideo confirmed Brazil's right to intervene in Uruguay's internal affairs. Brazil was required to extradite runaway slaves and criminals from Uruguay. In fact, during the war, both the Blancos and the Colorados had abolished slavery in Uruguay in order to mobilize the former slaves to reinforce their respective military forces. The treaties also allowed joint navigation on the Rio Uruguay and its tributaries, and tax exempted cattle and salted meat exports. The Uruguayan cattle industry was devastated by the war. The treaty also acknowledged Uruguay's debt to Brazil for its aid against the Blancos, and Brazil's commitment for granting an additional loan. Uruguay renounced its territorial claims north of the Río Cuareim, thereby reducing its area to about 176,000 square kilometers, and recognized Brazil's exclusive right of navigation in the Laguna Merin and the Rio Yaguaron, the natural border between the countries. Both parties were weary of the chaos. In 1870, they came to an agreement to define spheres of influence: the Colorados would control Montevideo and the coastal region, the Blancos would rule the hinterland with its agricultural estates. In addition, the Blancos were paid half a million dollars to compensate them for the loss of their stake in Montevideo. But the caudillo mentality was difficult to erase from Uruguay and political feuding continued culminating in the Revolution of the Lances (Revolución de las Lanzas) (1870–1872), and later with the uprising of Aparicio Saravia. The French author Alexandre Dumas described Oribe's siege of Montevideo as a new Trojan war. This comparison was made in the novel The new Troy. ^ Garibaldi in Uruguay: A Reputation Reconsidered. ^ a b c d e f The Great War, 1843–52. ^ George Bruce, Harbottle's Dictionary of Battles. Van Nostrand Reinhold, 1981. ISBN 0-442-22336-6. ^ a b "The Anthony P. Campanella Collection of Giuseppe Garibaldi". Wikimedia Commons has media related to Uruguayan Civil War.